Today I thought I would share some photos I took for recently for my friend Heleen Miller Aberson who started an online children’s clothing business a few months ago. Heleen and I first met and became friends when our boys were at nursery school together, I loved her Dutch sensibility and sense of fun and we soon became car boot buddies, sharing a love for all things vintage. We visit our local car boot sale together every month, meeting as the birds wake up, with coffees in hand and plenty of news to chat about as we rummage for treasure amongst the junk. If you were wondering why little girl above looks familiar then that’s because she is my daughter (she turned five earlier this month) and the our other pretty little model is Heleen’s daughter. We’ve done a few mini shoots at my home after school or early on a Saturday morning, trying to keep it quick and fun before the girls get too fidgety – which is easier said than done! It’s not the first time my daughter has modelled… in fact the teddy bear in the photo below has also modelled before too! We are all on the front cover of Anita Kaushal‘s gorgeous book FamilyLifestyle Home, taken in my living room when she was a tiny three months old. 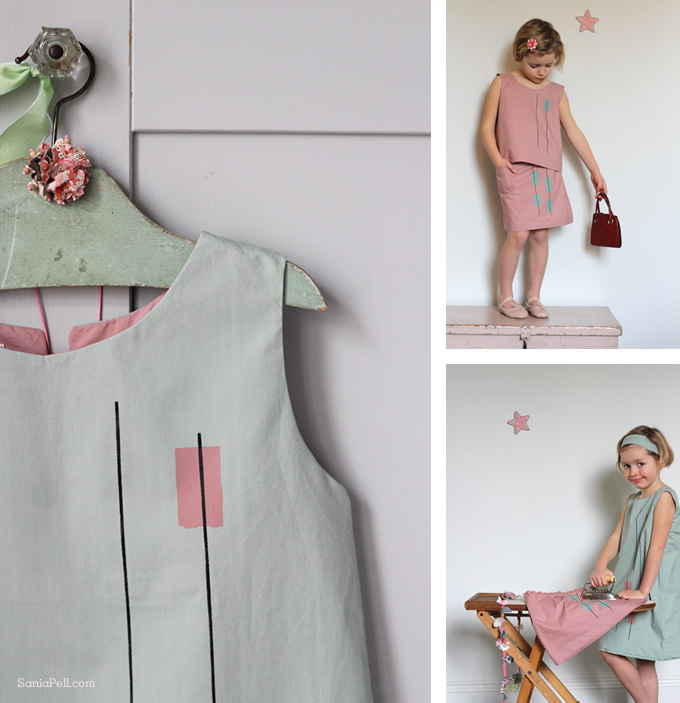 The clothes in the photos above and below are the latest Spring/Summer designs by Rokje London, a collaboration between Heleen and her Swedish friend Rebecka Bjurle. The clothes are inspired by retro prints and vintage cuts but brought up to date with soft colours. 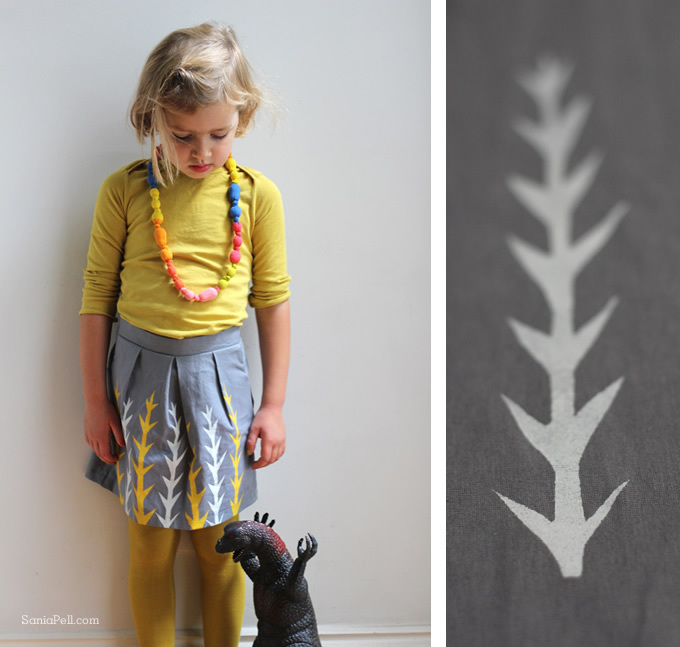 The tops are hand made from a beautiful 100% cotton fabric and they are all individually hand printed. All the tops are lined at the neck in the same colour as the print and they all have a fabric covered button at the back. These outfits are available now in their Etsy shop and there are more photos over there too. Have a look. 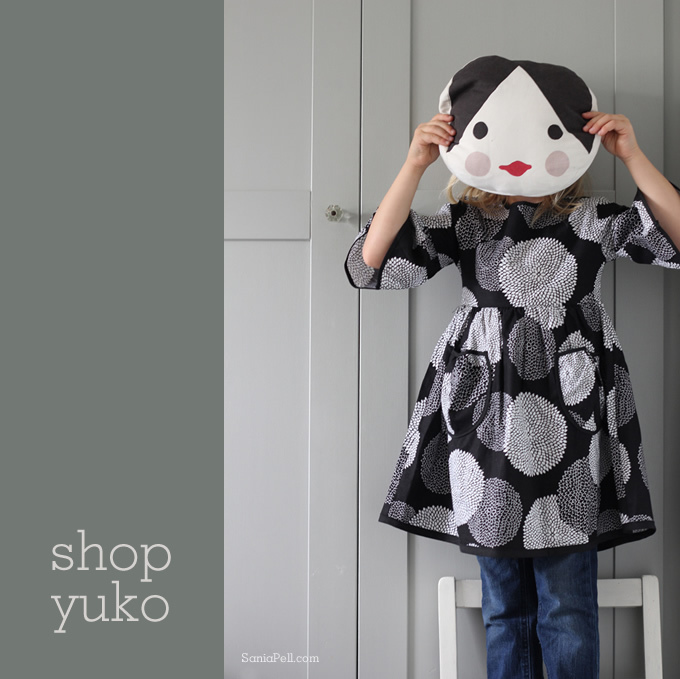 The photos above are from Rokje’s Winter collection and are available from the Shop Yuko website. They are all hand made and hand printed too. 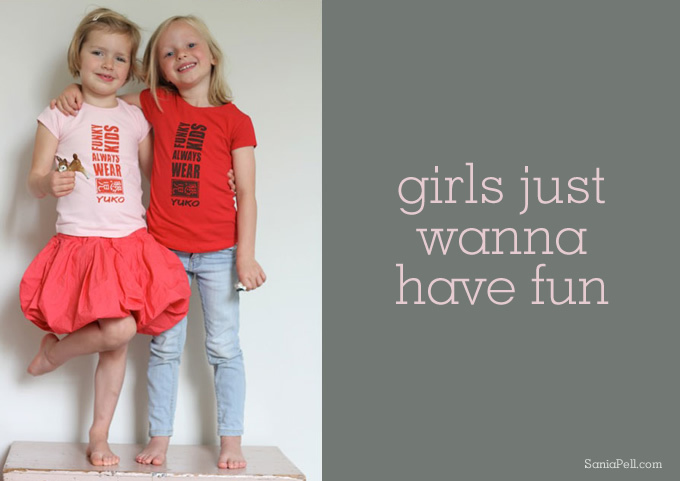 A few months ago Heleen started Shop Yuko, an online children’s wear shop which has been getting lots of interest which is fantastic. 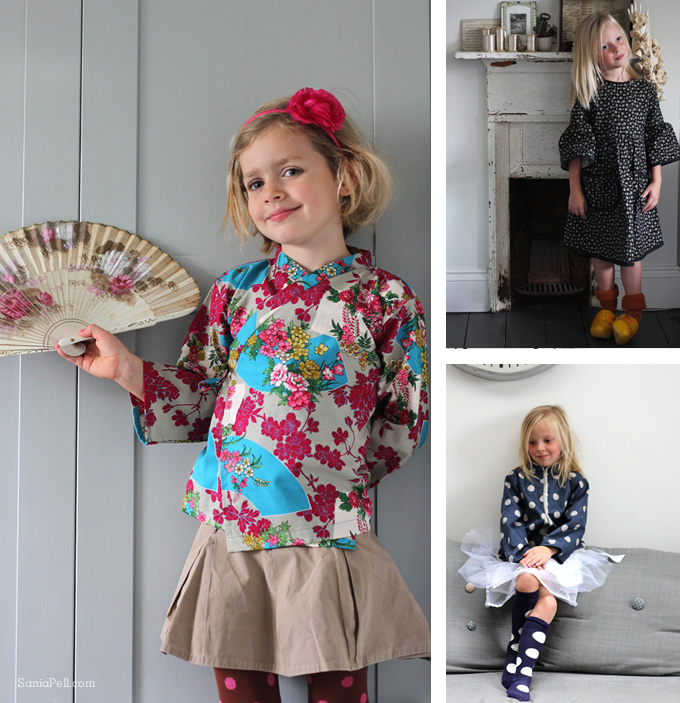 Her shop offers Eastern-inspired clothing that looks a little different from the usual high street children’s clothing. She stocks clothing by Shampoodle, Redfish, Lucky Wang, Sckoon, Pom Pom and her own label Rokje. You can see more on the Shop Yuko website and she also has a Shop Yuko Facebook page where there are more photos and news – plus my little boy makes an appearance too! I certainly don’t consider myself a photographer but I do enjoy taking photographs and a couple of these photos have been published in The Saturday Telegraph and Angels & Urchins magazine which is pretty amazing. And our little girls have had great fun getting dressed up and modelling too. I love my daughter’s little leg lift in the photos above which she did naturally! She also makes an appearance in some of the photos in my new book The Homemade Home for Children. Big girls ands little girls having fun with fashion and being creative. Strike a pose! There are certain unlikely and unexpected gifts that you just love. 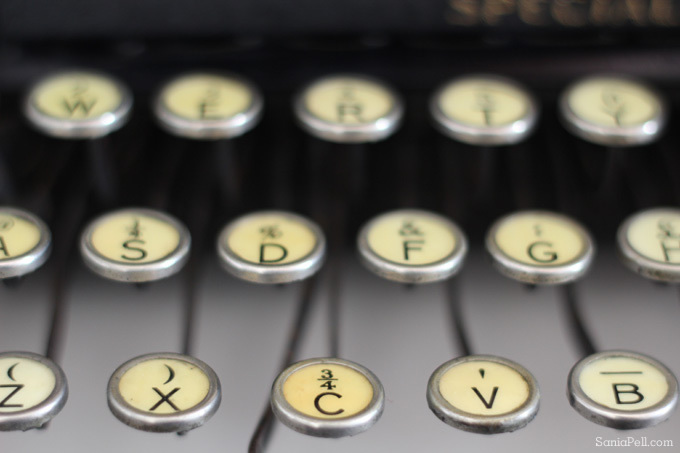 This beautiful old portable typewriter is one of those. My parents-in-law gave it to me as a Christmas gift and I was touched at how perfect a choice it was. I love its graphic quality as an object, and the thoughts of its history; the unknown letters, manuscripts and even books it may have been used to write. 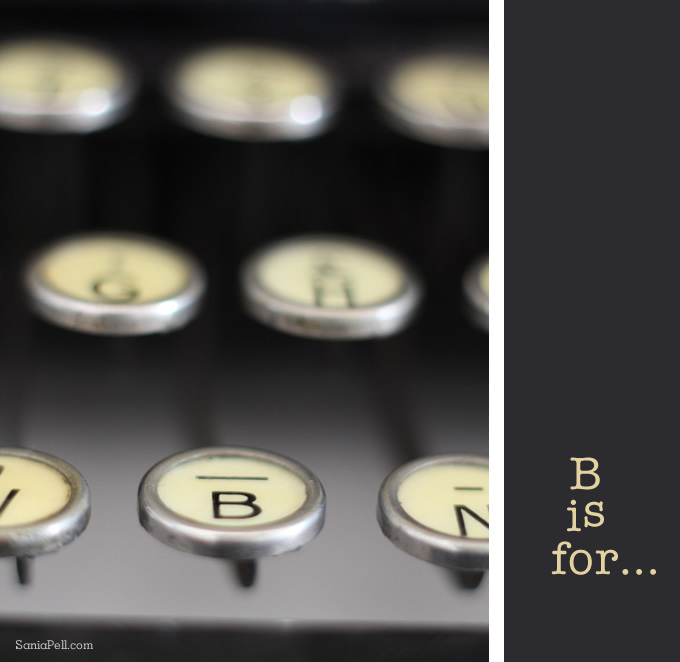 It seemed natural to place it on the bookshelf in my living room, nestled amongst the typed words. I placed an old sheet of paper from a vintage ledger in the roller and a postcard that I bought from Lutyens & Rubinstein bookshop in Notting Hill as a surprise detail for closer inspection. 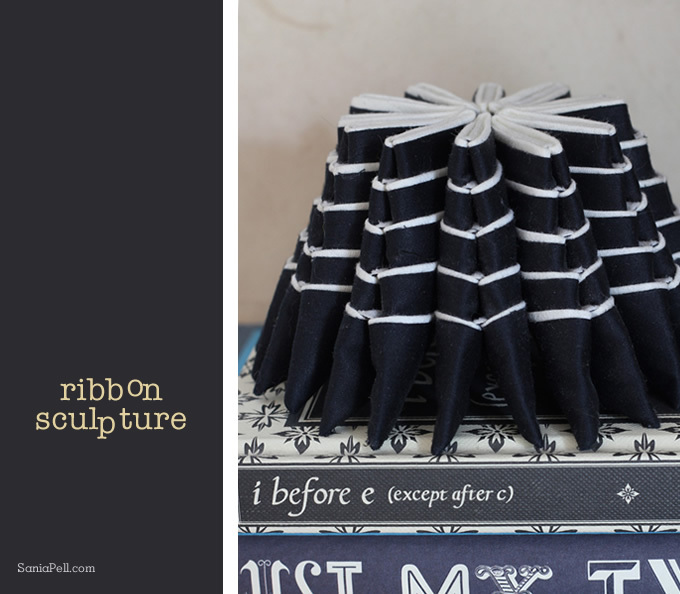 The fabric ribbon sculpture is by textile artist/designer Jessica Preston. I used it in an editorial photo shoot back in 2006, loved it and bought it from her afterwards. It still sits amongst my pile of books, like the turret on top of a tower. 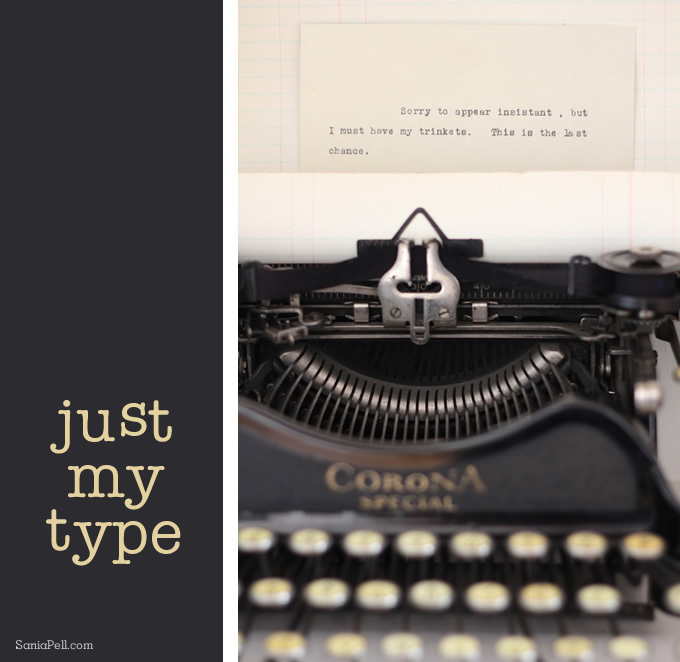 The typewriter doesn’t work at the moment and requires a little tinkering from my husband, but I am just imagining the little notes I will be able to write when it does. 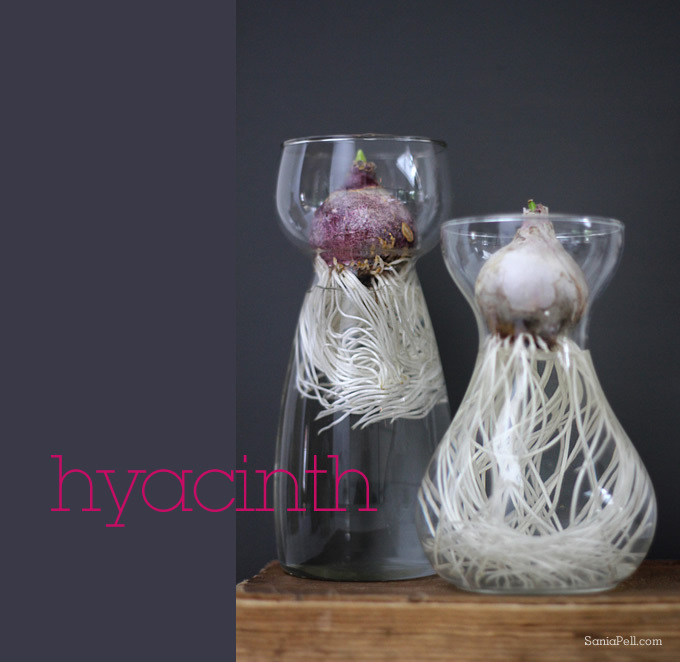 A few years ago I bought a basic glass hyacinth bulb holder which I use every year, placing it on my mantlepiece. Since then I have collected a couple more and always love the way the roots grow in the water and the interesting patterns they form before the plant has flowered. 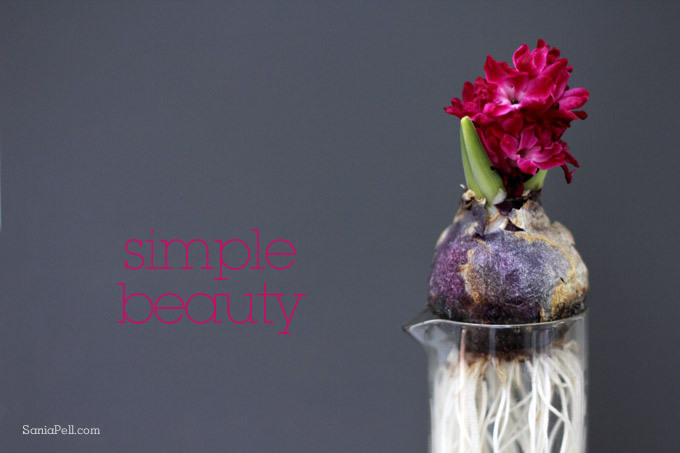 The bulb simply sits in the neck of the water-filled vase, acting as a stopper so the water rarely needs topping up. This year I bought a bag of bulbs at my local B&Q garden centre which contained many more bulbs than I had traditional vases for. I began thinking, what could I use as alternative vessels to sit the bulbs in? 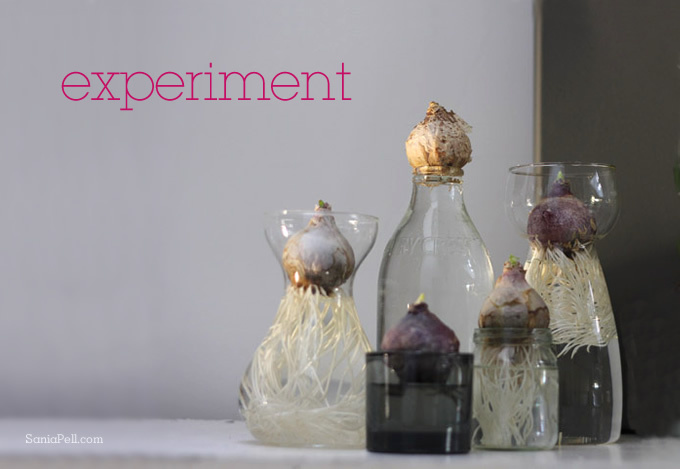 I love seeing the roots growing and it is important that the bulb rests on the water and not in it, so I scoured my cupboards and placed bulbs in the necks of milk bottles, on tea light candle holders, old jam jars and vintage glass and waited to see what would happen. 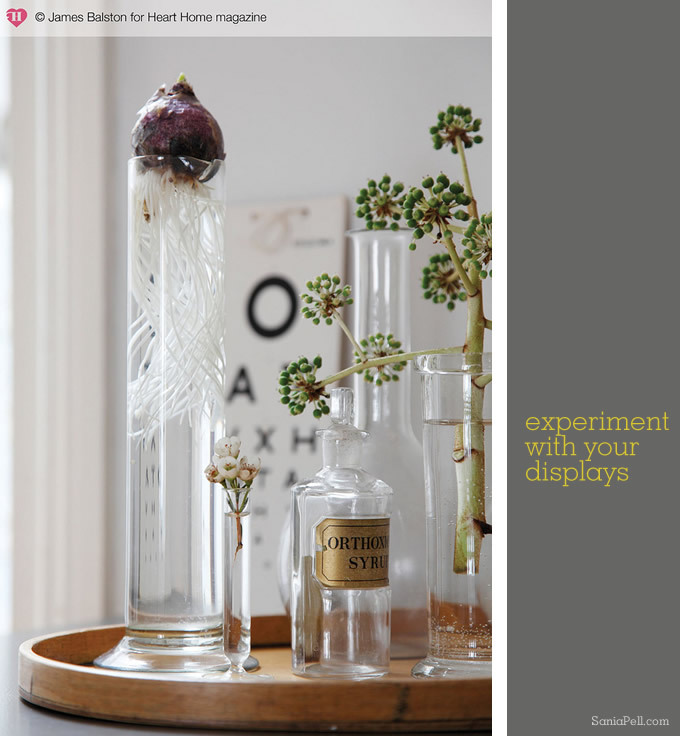 I included one of my bulb root experiments in a shot for Heart Home magazine where I placed a bulb in the neck of a piece of chemistry equipment I had bought at my local car boot fair – a tall glass measuring cylinder where the numbers had long since rubbed off. In these photos some of the bulbs had grown roots for a few weeks and others were freshly placed bulbs with no root growth at that time. I like clustering the vases together in a group for extra visual impact. Most of the hyacinths bloomed, although I don’t really mind if they don’t as the visual patterns the roots create make me happy. My plants are usually a little stunted and not tall like the ones I would buy at the florists but I still think they are beautiful. I’m sure there is a way of making them grow taller but I haven’t discovered the technique yet. 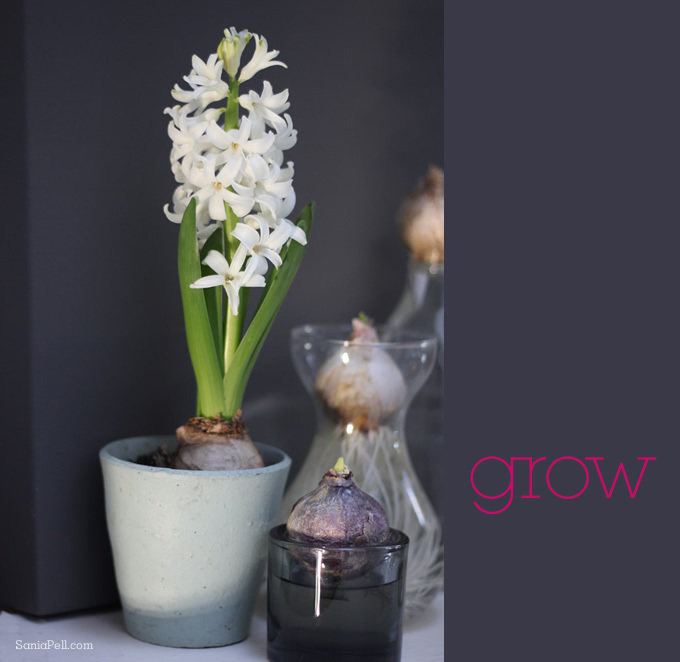 After the first batch have flowered you can begin again, placing a new bulb in fresh water and plant the others in the garden for the following year. I have just started on my second batch and next year I might experiment with different flower types too and see what happens. Today I would like to say thank you to Emma Lee, the talented photographer of my new book The Homemade Home for Children which will be out in a couple of months, and to share some photos of her home with you that I took while we were on location there for a day. I first worked with Emma almost 10 years ago on an Elle Decoration photo shoot and we became friends. We lived a 10 minute walk from each other at the time which meant we saw each other socially as well as working on jobs together and I was very happy when she agreed to photograph my new book. Emma has shot cook books for Gordon Ramsay, Mark Sargeant and Barrafina, editorial stories for Living Etc and Homes & Gardens magazines and commercial interiors shoots for clients including Fired Earth, M&S, Dulux, Cole & Son and Liberty. We worked hard on the shoots, had a lovely chance to catch up and have ended up with a book full of gorgeous photos. The snaps I took here are from her home in the Ashdown Forest, part of the famous Hundred Acre Wood where A.A. Milne’s Winnie-the-Pooh is set and the famous bridge is near by. It was a very wet Summer’s day and we worked inside whilst waiting for the rain to subside so we could take some images outside too. Luckily the rain did stop, the clouds broke and a few rays of sunshine meant we were able to take all the pictures we had planned on photographing. My children were there for the day too along with Emma’s sweet little dog Hesper, all taking part in a little modelling and helping us along the way. At the end of the shoot we had a moment to play Pooh Sticks in the little stream in the garden. Emma has effortless taste and everything she touches she makes more beautiful, one of the reasons why she is in such high demand for her work. 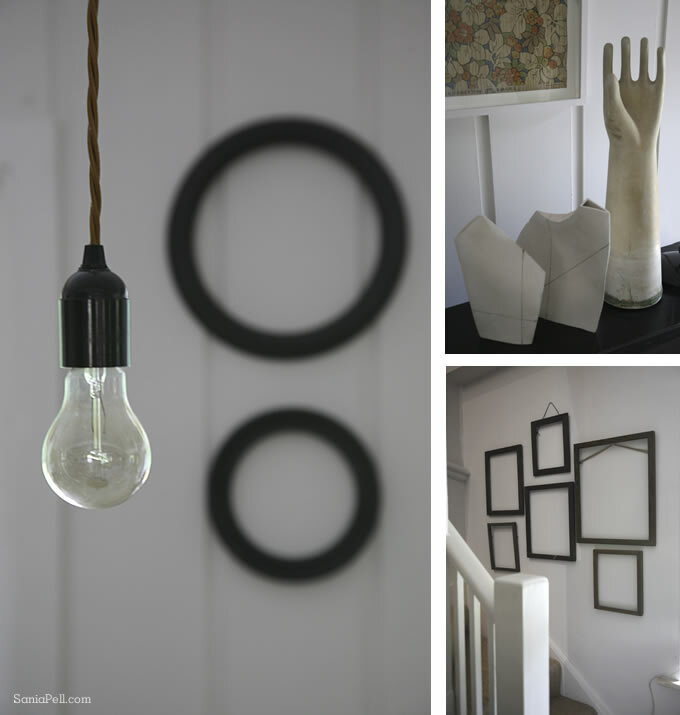 Her house is full of interesting and stylish objects with little surprises dotted about, keeping you excited to see what is around the next corner, and a divine colour palette; pale and muted with flashes of contrasting dark and brighter, fresh tones mixed in. There are many shades of grey too, a winning colour to me. What can I say, I have house envy every time I visit. We shot here for one day of the six shoot days so you will see more of her home in my new book. Have fun spotting were we placed some of the projects and see if you can tell which projects are here. Emma is represented by Pearson Lyle. Head over to their website to view Emma’s portfolio. You can pre-order The Homemade Home for Children: 50 thrifty and chic projects for creative parents now on Amazon UK and Amazon US. 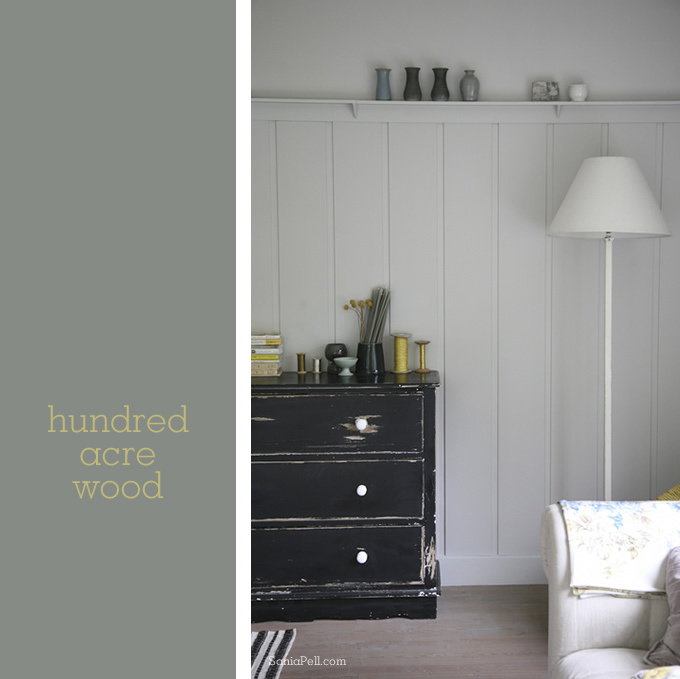 Thank you Emma for the beautiful photographs in my new book and a wonderful day in your home. 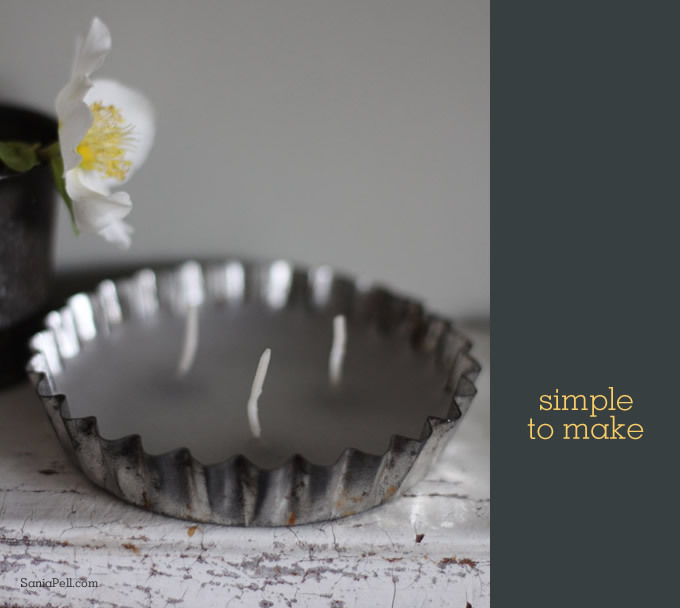 This is a simple idea I had that is easy to do and gave a result that I found pleasing – a candle made with common tea lights and a vintage tart tin. On my monthly car boot sale trips I had been buying various old baking trays, pots and jars for use as props in my Sugar/Spice shoot with Uli Schade. After the shoot I left them out on display in my studio to see if they inspired any ideas for what to do with them, rather than hide them away in one of my cupboards. I love the rich patina of the old, weathered cooking equipment and and the implied history this gives them. How old are they and how many times have they been used? Who were the cooks that used them? What did they bake and who was it for? These kind of questions always get my mind whirring imagining the answers to the life they had led. 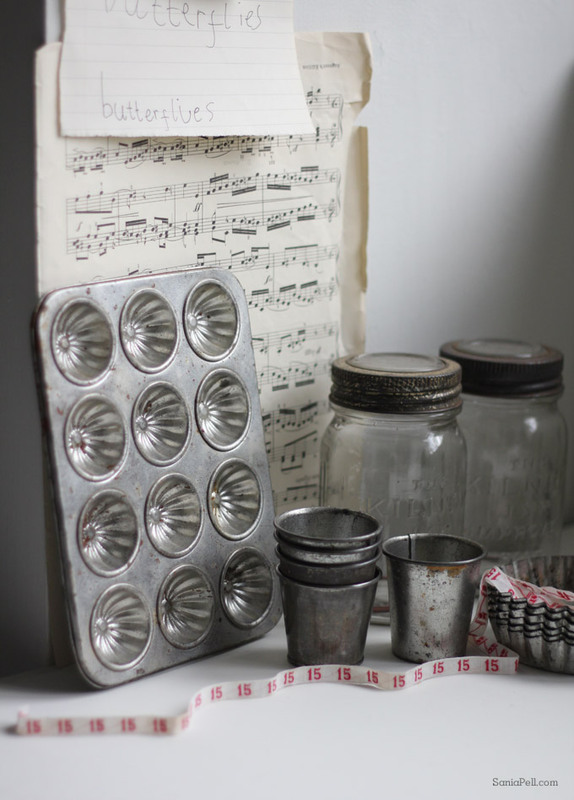 As I was looking in one of my kitchen cupboards one day I saw a bag of Ikea tea light candles and that sparked the idea to turn these vintage tins into candles. I took three of the Ikea tea lights and pushed the solid wax blocks out of their thin metal casings and then pulled out the wicks by their metal disks. 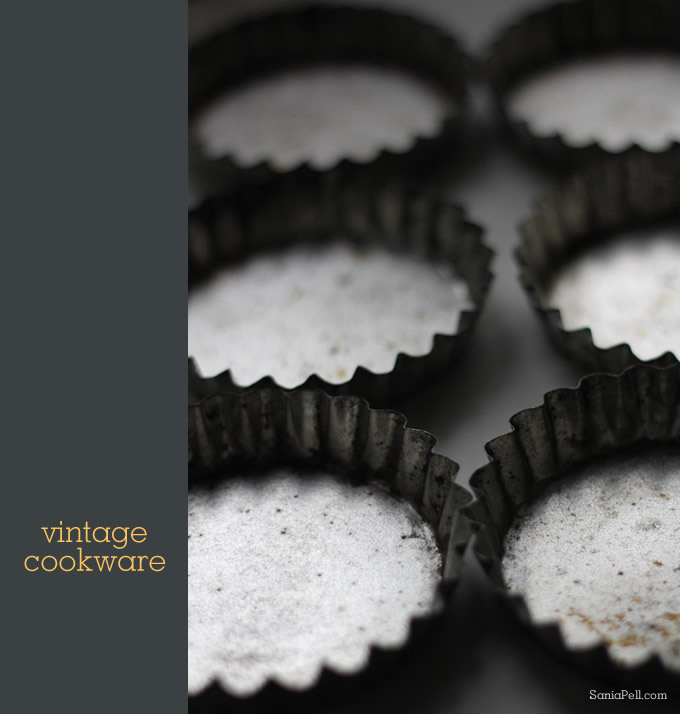 I placed the wax cylinders next to each other in one of the vintage tart tins, then placed it on the smallest of my gas cooker rings and melted them on a very low heat. When they had fully melted I turned off the flame, placed the wicks with the metal discs at the bottom into the desired position, leaving equal space between them, and then left it to cool. The wax hardened and I was left with a new simple candle. 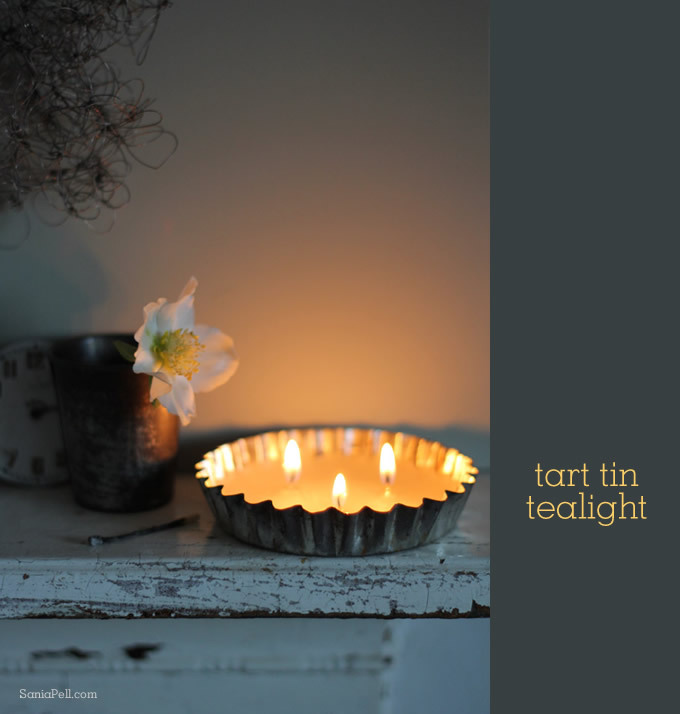 This idea could be extended to a whole tray of muffin tins with one melted tea light per compartment to make a great centrepiece to a table. 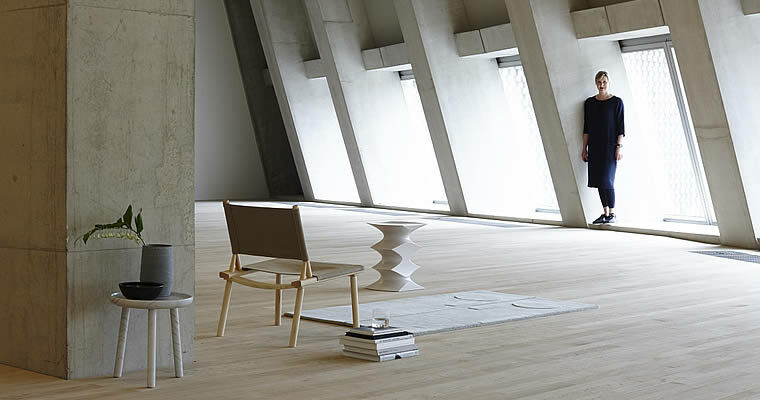 The base may need felt, cork or wood under it to protect the surface it sits on and, as with all flames, never leave them unattended. 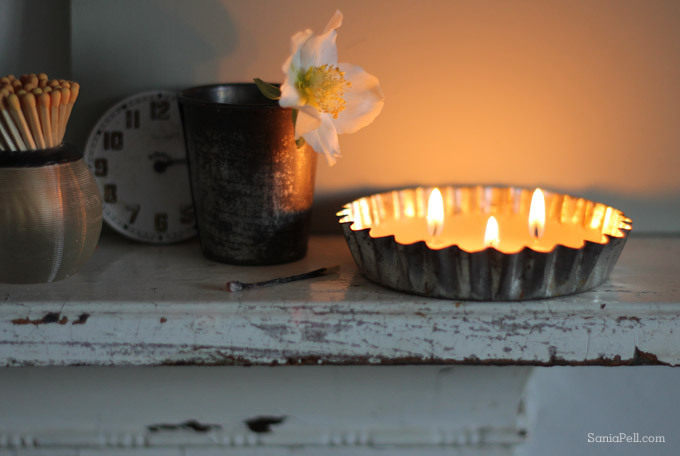 When the candles have been used up, the tin can be refilled in the same way to make another candle to enjoy. Simple little lights to warm up these cool, dark winter evenings. 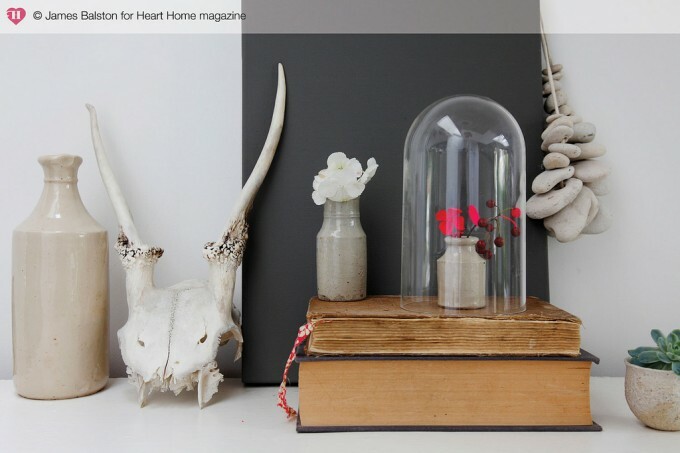 I’m sure many of you will be aware of Heart Home magazine that launched in September last year. 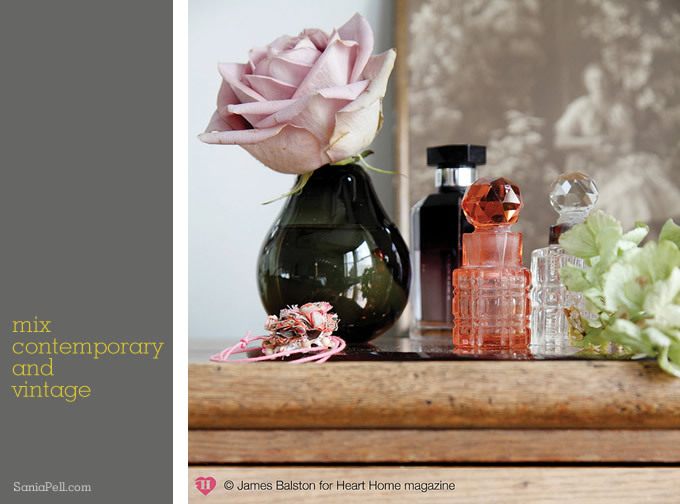 It’s a new quarterly digital publication founded by Arianna Trapani, Carole King and Daniel Nelson and showcases British homes and designers. 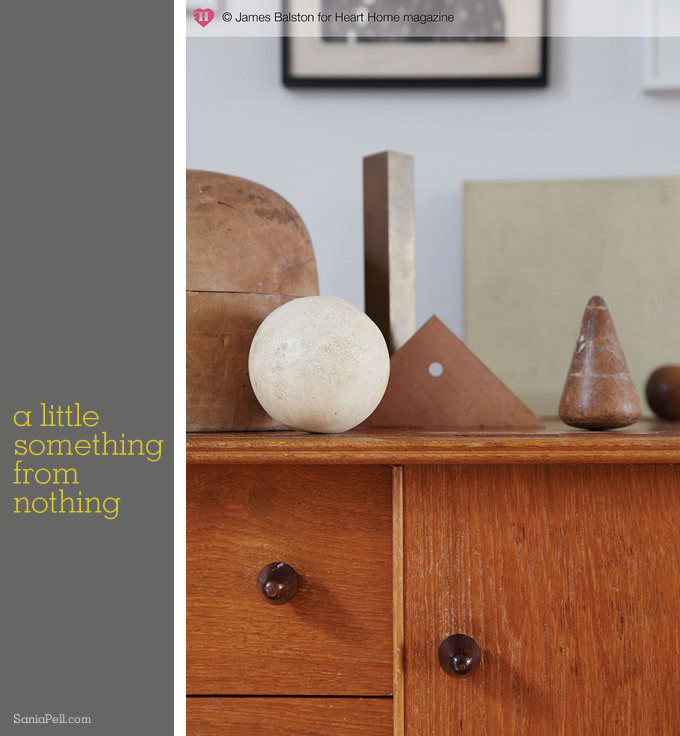 Snippets of my home were featured in the Winter issue last month in a story called ‘A little something from nothing‘. I wanted to create a different slant to the shoot so I styled mini displays around my home using the objects around me, each with its own little story. Many of the objects are inexpensive car boot sale finds, holiday treasures and trinkets, but I wanted to show how pleasing displays and vignettes can be made from very little. 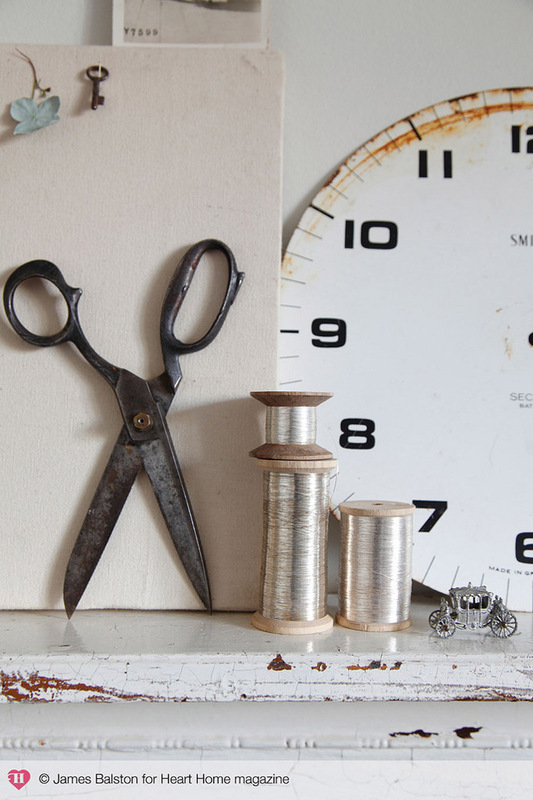 Small pockets of detail, where everyday items can become stars. 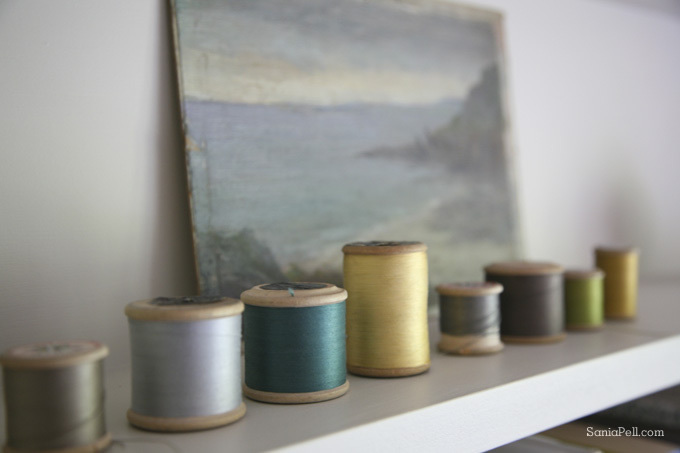 It is about embracing a pinch of handmade, a touch of homemade, nature, new items and vintage treasures – mixing them together to create new scenes, all of which should feel very personal and give joy when seen. This shelf is in my bedroom. 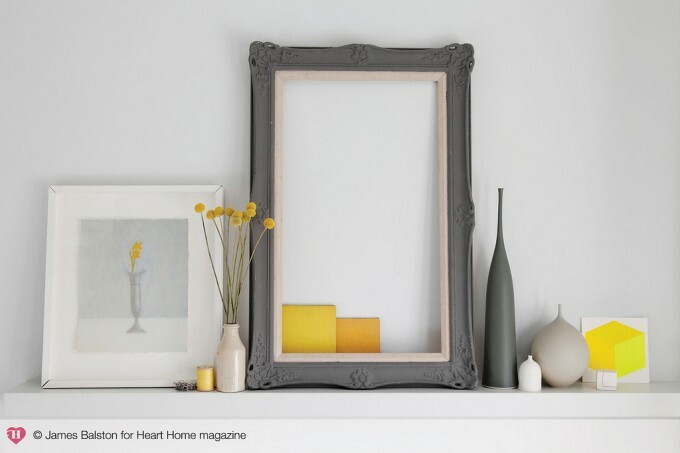 An empty picture frame creates a focal point and gives height to the display. You can see an earlier incarnation of this shelf in a previous blog post here. 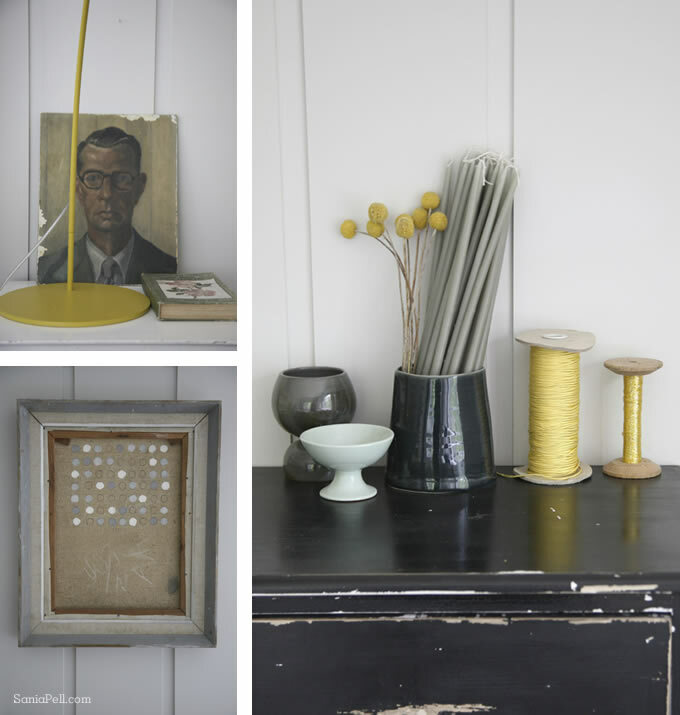 In my living room I evoked a 1950s sculptural feel with objects like old polo and billiards balls and vintage geometry sets in different woods and neutral tones. 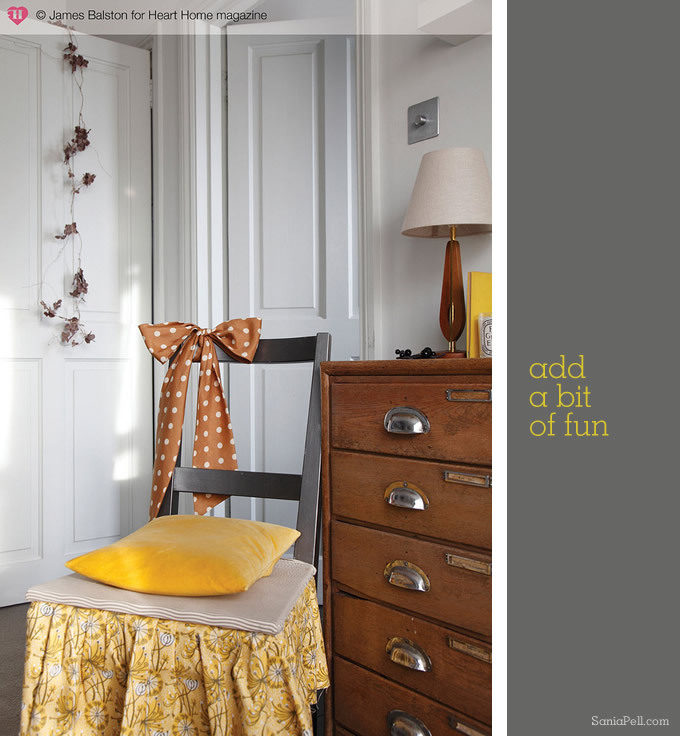 This is an Ikea chair that I revamped a while back with a fun skirt in St Jude’s fabric and a giant silk bow. Vintage flea market perfume bottles sit with contemporary vases and bottles and a necklace by Emma Cassi. Here a painted canvas acts as a backdrop to vintage clay bottles used as vases for flowers painted with fluorescent paint. 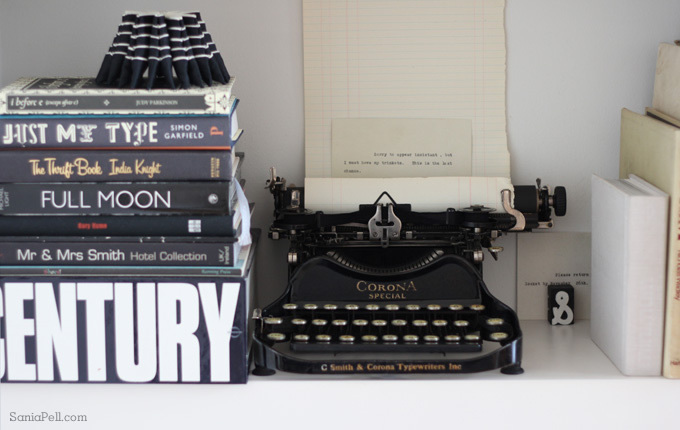 Old books with the pages facing out add height and natural finds in similar tones add quirky interest – a deer skull that my husband and young son found on a walk in the countryside and beach-combed pebbles with holes in simply strung together. Here my collection of old chemistry and laboratory equipment become unexpected vases for interesting flora and fauna. All of these were items were bought at car boot sales. 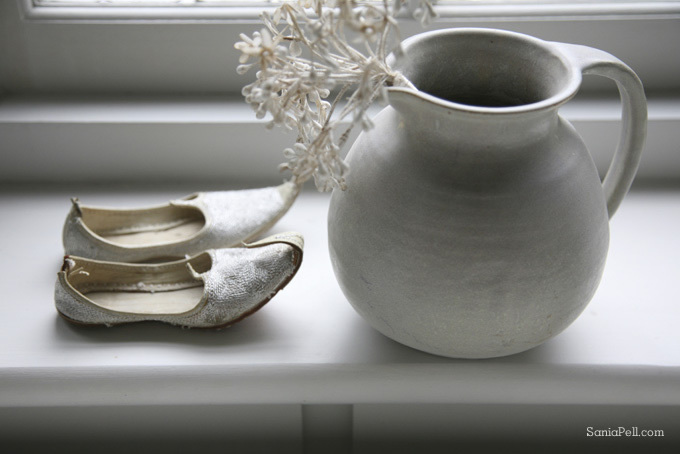 In my work room, displays of objects I use and work in progress become inspiration in themselves. 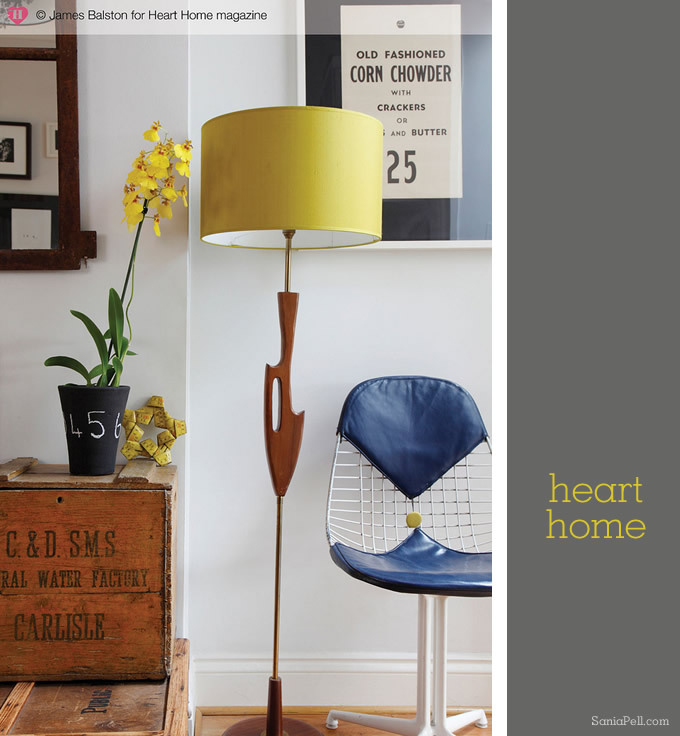 For more tips on how to achieve interesting, fun displays in your home head over to Heart Home to read the full article. The day of the photo shoot was a pleasure with lovely photographer James Balston taking all of these images. You can see James’s work over on his blog. 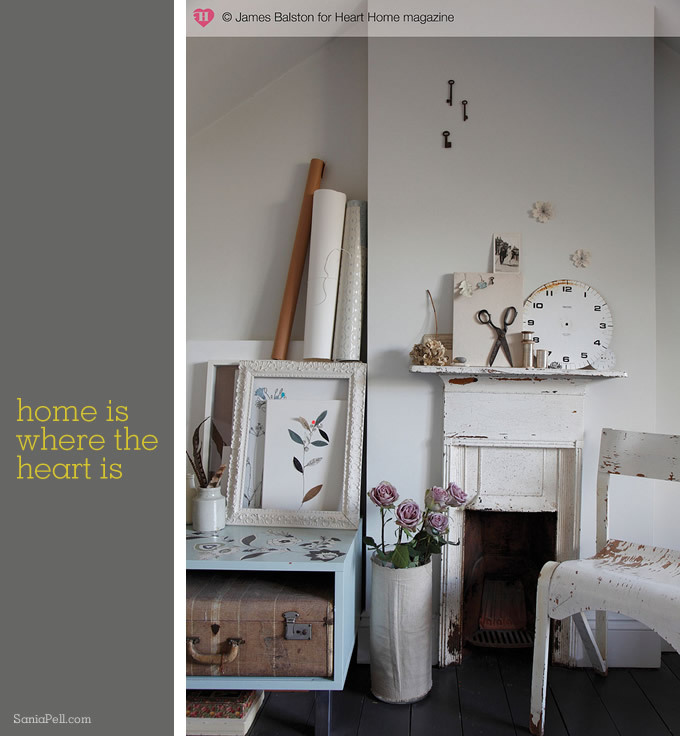 If you haven’t seen Heart Home yet do go and take a look at the Winter issue and the first issue and the Heart Home blog. I’m looking forward to seeing what the Spring issue has in store!